In a search for genes expressed by dendritic cells (DC), we have cloned cDNAs encoding different forms of an asialoglycoprotein receptor (ASGPR). The DC-ASGPR represents long and short isoforms of human macrophage lectin, a Ca2+-dependent type II transmembrane lectin displaying considerable homology with the H1 and H2 subunits of the hepatic ASGPR. Immunoprecipitation from DC using an anti-DC-ASGPR mAb yielded a major 40-kDa protein with an isoelectric point of 8.2. DC-ASGPR mRNA was observed predominantly in immune tissues. Both isoforms were detected in DC and granulocytes, but not in T, B, or NK cells, or monocytes. DC-ASGPR species were restricted to the CD14-derived DC obtained from CD34+ progenitors, while absent from the CD1a-derived subset. Accordingly, both monocyte-derived DC and tonsillar interstitial-type DC expressed DC-ASGPR protein, while Langerhans-type cells did not. Furthermore, DC-ASGPR is a feature of immaturity, as expression was lost upon CD40 activation. In agreement with the presence of tyrosine-based and dileucine motifs in the intracytoplasmic domain, mAb against DC-ASGPR was rapidly internalized by DC at 37°C. Finally, intracellular DC-ASGPR was localized to early endosomes, suggesting that the receptor recycles to the cell surface following internalization of ligand. Our findings identify DC-ASGPR/human macrophage lectin as a feature of immature DC, and as another lectin important for the specialized Ag-capture function of DC. Dendritic cells (DC)3 are APCs that are required for initiation of a specific T cell-driven immune response (1). As exemplified by Langerhans cells (LC) in the epidermis, DC residing in nonlymphoid tissue are immature cells whose primary function is to capture Ag (2). This function is achieved either through macropinocytosis, which allows concentration of solutes present in large volumes of fluid (3), or through specialized surface-membrane endocytic receptors. DC thus express several Ca2+-dependent (C-type) endocytic lectins, exemplified by DEC205 (4), the mannose receptor (MR) (3), or Langerin (5). Cell-surface receptors, such as low-density lipoprotein receptors, transferrin receptors, or scavenger receptors, including type II lectins, are also involved in endocytic processes in other cell types (6, 7, 8). For example, parenchymal cells of mammalian liver and macrophages express hepatic asialoglycoprotein receptor (ASGPR) H1 and H2 subunits, and macrophage-ASGPR (human macrophage lectin (HML)), respectively (9). The HML is homologous to H1 and is a type II lectin with a single Ca2+-dependent carbohydrate recognition domain (CRD), a neck domain, and an intracytoplasmic domain containing internalization motifs (10). Endocytosis and recycling of the hepatic ASGPR receptor, which internalizes desialylated serum glycoproteins with exposed galactose residues, have been well characterized (11). Thus, ligand bound to receptors is directed to coated pits, which bud off to form coated vesicles. The receptor-ligand complex is delivered by these vesicles to endosomes, where dissociation occurs, so that the receptor can recycle to the plasma membrane and the ligand can be directed to other intracellular locations, such as lysosomes. To identify novel receptors expressed by DC, we searched for lectins selectively expressed by DC subpopulations. Using random sequence analysis, we have characterized the DC-ASGPR as representing isoforms of the HML. The two forms of DC-ASGPR described in this report differ by the presence of a unique 27-aa insert in the extracellular region of the long form. Both forms display a 3-aa deletion as compared with the HML. DC-ASGPR/HML is preferentially expressed in immature monocyte-derived and interstitial-type DC where it localizes both at the cell surface and in early endosomes. Finally, anti-DC-ASGPR mAb rapidly provokes internalization from the DC surface at 37°C. Together, our data demonstrate that DC-ASGPR/HML constitute another set of receptors by which immature DC can efficiently capture Ag. Recombinant human (rh)GM-CSF (specific activity: 2 × 106 U/mg; Schering-Plough Research Institute, Kenilworth, NJ) was used at a saturating concentration of 100 ng/ml (200 U/ml). rhTNF-α (specific activity: 2 × 107 U/mg; Genzyme, Boston, MA) was used at an optimal concentration of 2.5 ng/ml (50 U/ml). Recombinant human stem cell factor (SCF) (specific activity: 4 × 105 U/mg; R&D Systems, Abington, U.K.) and rhM-CSF (specific activity: 2 × 106 U/mg; R&D Systems) were used at an optimal concentration of 25 ng/ml. PBMC were obtained from healthy donors after Ficoll-Hypaque gradient centrifugation (density = 1.077; Eurobio, Paris, France). T cells were purified from PBMC by immunomagnetic depletion (Dynal, Oslo, Norway) using a mixture of mAbs (CD14, CD16, CD35, HLA-DR (Immunotech, Marseille, France), CD19 (ascites), NKH1 (Beckman Coulter, Hialeah, FL), and CD40 (mAb 89, produced in our laboratory)). The purity of CD3+ T cells was >95%. B cells were obtained from human tonsils as described (12). Briefly, T cells were first depleted by rosetting SRBC, and then the residual non-B cells were removed by immunomagnetic depletion using a mixture of mAbs (CD2, CD3, CD4, CD14, CD16, NKH1, and CD35). The purity of CD19+ B cells was >98%. LC were prepared from normal skin by CD1a positive selection as described (13). A >95% purity was systematically achieved. Granulocytes were generated in vitro from CD34+ progenitors in the presence of SCF supplemented with G-CSF for 12 days (14) or isolated from peripheral blood by Polymorphprep gradient (Nycomed, Oslo, Norway). Macrophages were generated in vitro from CD34+ progenitors in the presence of SCF supplemented with M-CSF for 12 days (15). Cells were either resting or activated by PMA-ionomycin (PMA, 1 ng/ml (Sigma-Aldrich, St. Louis, MO); ionomycin, 1 μg/ml (Calbiochem, La Jolla, CA)) for 1 and 6 h and pooled. The MRC5 fibroblastic cell line was obtained from American Type Culture Collection (Manassas, VA) and stimulated by PMA-ionomycin for 1 and 6 h and pooled. Murine fibroblasts transfected with human CD40 ligand (CD40L L cells) were produced in the laboratory (12). All cell types were cultured in RPMI 1640 (Life Technologies, Gaithersburg, MD) supplemented with 10% (v/v) heat-inactivated FBS (Flow Laboratories, Irvine, U.K.), 10 mM HEPES, 2 mM l-glutamine, 5 × 10−5 M 2-ME, penicillin (100 U/ml) and streptomycin (100 μg/ml), hereafter referred to as complete medium. Umbilical cord blood samples were obtained according to institutional guidelines. Isolation of CD34+ progenitors was achieved using Minimacs separation columns (Miltenyi Biotec, Bergish Gladbach, Germany) as described (16). In all experiments the isolated cells were 80–99% CD34+ as judged by staining with anti-CD34 mAb. Cultures of CD34+ cells were established in the presence of SCF, GM-CSF, and TNF-α as described (17). Culture medium was supplemented with 5% AB+ pooled human serum at the initiation of the cultures. By days 5–6 human serum was washed away, and cells were further cultured in presence of GM-CSF and TNF-α until days 12–17 when 70–90% of cells are CD1a+ DC. Monocytes were purified by immunomagnetic depletion (Dynal) after preparation of PBMC, followed by a 52% Percoll gradient. The depletion was performed with anti-CD3, anti-CD19, and anti-CD8 ascites, purified anti-NKH1 (Beckman Coulter), and anti-CD16 (Immunotech) mAbs. Monocyte-derived DC were produced by culturing purified monocytes for 6 days in the presence of GM-CSF and IL-4 with or without activation with LPS (25 ng/ml) for 1–72 h (18). Total RNA was isolated from 70% resting CD1a+ DC (at day 12 of the culture of CD34+ sorted cells). RNA was treated with DNase I before mRNA purification using the Oligotex-dT kit (Qiagen, Hilden, Germany). Poly(A)+ RNA (2 μg) was used to make a cDNA library using the SuperscriptII system (Life Technologies). An average of 650 bp of highly unambiguous expressed sequence tag from individual clones were determined. The sequences were analyzed for possible encoded function by basic local alignment search tool (BLAST)N searches vs the public databases, followed by BLASTP searches of the open reading frames (19). By this method, two DC-ASGPR expressed sequence tags from a total of 1190 (ETA10 and KKA07) were obtained and identified via BLASTX analysis as a homolog of the hepatic ASGPR. Then, two full-length clones, DC-ASGPR short (LWA11) and long (JLA6) were isolated by preparing a probe from the original ETA10 insert and using colony hybridization of DC cDNA libraries (20). Multiple tissue normal fetal and adult organ Northern blots (MTN blots #7760-1, #7759-1, #7767-1 and immune system (MTN) blot #7754-1; Clontech, Palo Alto, CA) were used according to the manufacturer’s recommendations. Southern blots were prepared as described (20). Genomic DNA was cut with the enzymes BamHI or SacI under standard conditions and fragments were separated on a 1% Tris-acetate-EDTA agarose gel, then transferred to Hybond-N (Amersham Pharmacia Biotech, Uppsala, Sweden) overnight in 0.4 M NaOH, 10× SSC. Hybridization of Southern and Northern blots was with a 700-bp original clone ETA10 labeled with [32P]dCTP using the High Prime kit (Boehringer Mannheim, Meylan, France). Unincorporated nucleotides were removed by spin column chromatography (Chromaspin-100; Clontech). Hybridization and washes were performed in stringent conditions (0.1× SSC/0.1% SDS at 65°C). The membranes were incubated with Biomax MR film (Kodak, Rochester, NY) for 21 days. Cells were lysed and total RNA was extracted (21) and used for the preparation of first-strand cDNAs. First-strand cDNAs were prepared after DNase I treatment (in the presence of RNase inhibitor) of 5 μg of total RNA using oligo(dT) primers (Amersham Pharmacia Biotech) and the Superscript kit. Synthesis of cDNAs was controlled by performing RT-PCR using β-actin primers. PCR were performed in a 100-μl volume using 1 μl of cDNA, 10 μl of 10× PCR buffer (PerkinElmer/Cetus, Norwalk, CT), 2.5 U of Taq polymerase (Gene Amp PCR reagents kit; PerkinElmer/Cetus), 200 mM dNTPs, and 500 nM of the 5′ and 3′ amplification primers. PCR were performed in a DNA thermal cycler (PerkinElmer/Cetus) for 35 cycles (1-min denaturation at 94°C, 1-min annealing at 60°C, and 2-min elongation at 72°C). Sense (5′JF46: GGGTTTCAAGCAGGAACGGCAGG) and antisense (nucleotides 5′JF52: ATCCACCCACTTCCAGGCTCC) primers were used to amplify human DC-ASGPR cDNA (1 ng/ml). Double-stranded plasmid DNA was sequenced on an ABI 373A sequencer (Applied Biosystems, Foster City, CA) using dye terminator technology. Sequencher (Gene Codes, Ann Arbor, MI) and Lasergene (DNAstar, London, U.K.) software was used to analyze sequences. Comparisons against GenBank databases were performed using the BLAST algorithm. Human DC-ASGPR (JLA6) exodomain-IgG and HRP fusion proteins were produced, and mAbs were generated as described (22). Briefly, the pFlagCMV3 (Kodak) vector was used for expression, first transiently in the COS cell line and later from stable CHO lines. The Ig fusion protein was purified from supernatant by HiTrapA chromatography (Amersham Pharmacia Biotech). For production of the hDC-ASGPR-HRP fusion protein, COS cells were transfected with the DC-ASGPR-HRP vector using the FuGENE 6 transfection reagent (Boehringer Mannheim) according to the manufacturer’s instructions. After 4–5 days of culture in RPMI 1640 medium without phenol red and FCS, the cell supernatant was collected and used as a protein source. mAbs were produced by immunizing BALB/c mice (Iffa Credo, Les Oncins, France) with three i.p. injections of 2 μg of purified DC-ASGPR-Ig fusion protein in IFA (Sigma-Aldrich). Spleens were removed 3 days after a final i.v. injection of DC-ASGPR-Ig in PBS and splenocytes were fused with the murine SP2 myeloma cell line using polyethylene glycol-1000 and cultured in 96-well plates using standard procedures. Hybridoma supernatants were screened for their reactivity against DC-ASGPR-HRP fusion protein by ELISA. Briefly, supernatants were incubated in microtiter plates (Nunc, Glostrup, Denmark) previously coated with goat anti-mouse IgG (Fcγ fragment-specific; Jackson ImmunoResearch Laboratories, West Grove, PA). After two washes, 100 μl of supernatants of COS cells transfected with the DC-ASGPR-HRP vector were added and plates were incubated for 2 h at room temperature. Plates were then washed twice, and the presence of anti-DC-ASGPR mAbs complexed to the DC-ASGPR-HRP fusion protein was determined by adding 100 μl of 3,3′,5,5′-tetramethylbenzidine Microwell peroxidase substrate (Kirkegaard & Perry Laboratories, Gaithersburg, MD). After cloning of selected hybridomas, mAbs were produced as ascites fluids and purified. By flow cytometric analysis, all mAbs recognized COS cells transfected with the full-length cDNA encoding DC-ASGPR, but not mock-transfected cells (data not shown). Data presented in the present study were obtained with the anti-DC-ASGPR mAb AS-3 of IgG1 isotype. mAb AS-3 recognizes both the long and short forms of DC-ASGPR as based on reactivity on cellular transfectants. Cell-surface expression of DC-ASGPR was determined by immunofluorescence staining and flow cytometric analysis with a FACSCalibur (BD Biosciences, Mountain View, CA). For single staining, cells were incubated for 30 min at 4°C with 10 μg/ml purified anti-DC-ASGPR mAb, then washed twice in PBS, 1% BSA, and 0.1% NaN3, and labeled with PE- or FITC-conjugated F(ab′)2 goat anti-mouse Ig (DAKO, Glostrup, Denmark). Nonspecific staining was determined by using isotype-matched control mAb. All procedures were performed in the presence of 0.5 mM EDTA to avoid cell aggregation, and intracytoplasmic staining was performed in saponin. Microscope slides of acetone-fixed cryocut tonsil sections were incubated with 10 μg/ml anti-DC-ASGPR mAb for 60 min, and subsequently with sheep anti-mouse IgG1 (The Binding Site, Birmingham, U.K.) followed by mouse alkaline phosphatase anti-alkaline phosphatase technique (DAKO). Alkaline phosphatase activity was revealed using the Fast Blue substrate (Sigma-Aldrich). For double staining, tonsil sections were incubated with mouse IgG1 anti-MR (DCGM1, produced in our laboratory) mAb and IgG2b anti-CD1a (BD Biosciences), revealed by sheep anti-mouse IgG1 and alkaline phosphate anti-alkaline phosphatase technique (as described above) and biotinylated sheep anti-mouse isotype-specific IgG (The Binding Site) followed by ExtrAvidin-peroxidase (Sigma-Aldrich). Alkaline phosphatase activity and peroxidase activity were respectively demonstrated using Fast Blue substrate and 3-amino-ethyl carbazole (Sigma-Aldrich). CD34-derived DC were generated as detailed above and internalization was performed as described (23). One aliquot of cells was fixed with 0.1% paraformaldehyde for 5 min at room temperature and another aliquot was used without fixation. Both samples were stained with mAb anti-DC-ASGPR, mAb anti-CD1a, or mAb DCGM1 for 40 min on ice and incubated with biotin-labeled F(ab′)2 goat anti-mouse IgG (Jackson ImmunoResearch Laboratories) for 1 h on ice. Cells were placed in a 37°C water bath for various time periods, cooled on ice, and stained with PE-conjugated streptavidin (BD Biosciences). After washing, cells were analyzed by FACS. The measure of internalization is given by the percentage decrease of cell-surface median fluorescence intensity (MFI) as compared with control samples kept at 4°C. The percentage decrease of MFI observed in fixed cells was taken as a measure of the off-rate of the Ab at 37°C. mAb DCGM1 (anti-MR) was used as positive control for receptor-mediated endocytosis. Proteins were extracted from CD34-derived DC supplemented with TGF-β by addition to a frozen pellet of 100 μl/107 cells of 50 mM Tris-HCL (pH 8) buffer with 150 mM NaCl, 5 mM EDTA, 1% Triton X-100, and protease inhibitor (Complete Mini; Boehringer Mannheim). After 1 h at 4°C, samples were centrifuged to remove cellular debris. Supernatants were then incubated for 1 h at 4°C with DC-ASGPR mAb covalently linked to Dynabeads M-450 sheep anti-mouse IgG magnetic beads (Dynal). Beads were washed with extraction buffer using a Dynal magnetic particle-concentrator and boiled in the presence of 50 μl of SDS-PAGE sample buffer or resuspended in 100 μl of 0.5 M glycine and 0.15 M NaCl (pH 2.3) for 4 min. Then supernatant was neutralized with 3.5 μl of saturated Tris solution. 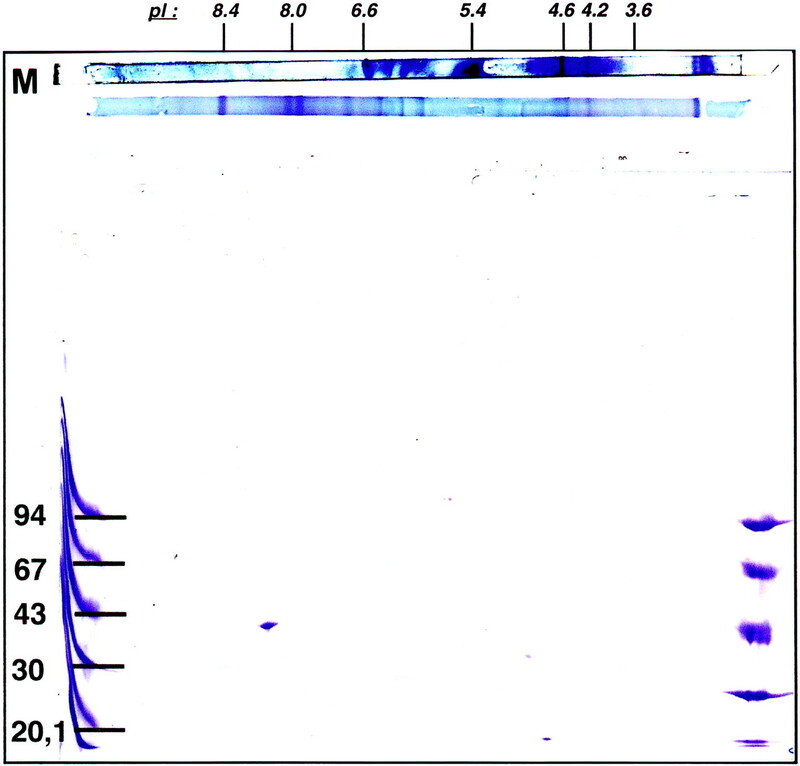 Two-dimensional analysis was performed on a Excelgel SDS 8–18% for the second dimension (Amersham Pharmacia Biotech), and gel was silver-stained. Immunoelectron microscopy was performed as described previously (5). Briefly, cells were fixed in 2% paraformaldehyde, washed, and embedded in 10% gelatin. Small blocks were infiltrated with 2.3 M sucrose for 4 h at 4°C, mounted, and frozen in liquid nitrogen. Ultrathin cryosections were indirectly immunolabeled with DC-ASGPR mAb and polyclonal anti-HLA-DR (24) (the kind gift of Dr. H. L. Ploegh, Department of Pathology, Harvard Medical School, Boston, MA), and visualized with 15 and 10 nm gold particles, respectively. Sections were then embedded in a mixture of 2% methyl cellulose and 0.4% uranyl. A 0.7-kbp partial cDNA, ETA10, was isolated by random sequence analysis of a CD1a+-derived DC library, then a full-length 1.5-kbp cDNA sequence (clone JLA6) was obtained. It contains a 5′-untranslated sequence (nucleotides 1–256), a 951-bp open reading frame (nucleotides 257-1207) starting with a methionine codon situated in a consensus Kozak sequence, a 3′-untranslated sequence of 252 nucleotides, and an AATAAA polyadenylation signal at position 1440. The predicted polypeptide sequence of 316 amino acids has the typical features of a type II integral membrane lectin containing an NH2-cytoplasmic domain of 40 residues, a hydrophobic transmembrane domain (20 residues), a long neck domain, and a single CRD containing a QPD motif predictive of Gal/N-acetyl-galactose reactivity (Fig. 1⇓A). The sequence also indicates two potential N-glycosylation sites (Asn-X-Ser/Thr). Finally, the intracytoplasmic portion contains two putative internalization signals: a tyrosine-based YENF motif and a dileucine motif (Fig. 1⇓A). Deduced amino acid sequence of human DC-ASGPR. A, Alignments of the two isoforms of DC-ASGPR with human, mouse, and rat macrophage lectin. Amino acids conserved between DC-ASGPR and other type II lectins are shaded. Potential internalization motifs are labeled by asterisks. Amino acid insertions and deletions specific for DC-ASGPR are marked by filled arrows, and the transmembrane domain is boxed. The CRD is underlined and residues conserved in the calcium-binding domain are labeled by open arrows. B, Phylogenetic tree showing the relationship between DC-ASGPR/HML and other C-type lectins. DC-ASGPR, mouse, and rat macrophage lectins, human hepatic lectins (H1 and H2), rodent Kupffer cell receptors, and chicken hepatic lectin were analyzed using the MegAlign function of Lasergene (DNAstar). Accession numbers are as follows: HML (D50532), MMGL (NP-034926), rat macrophage lectin (J05495), human hepatic lectin H1 (P07306) and H2 (P07307), mouse Kupffer cell receptor (P70194), rat Kupffer cell receptor (P10716), and chicken hepatic lectin (P02707). The full-length cDNA (clone JLA6) revealed that DC-ASGPR is an isoform of the HML (10) containing an insertion of 27 amino acids and a deletion of three amino acids in the neck domain. Furthermore, we have also isolated a short form of the DC-ASGPR (clone LWA11) containing only the 3-aa deletion as compared with HML (Fig. 1⇑A). The predicted amino acid sequence homology with other type II lectins is highest between DC-ASGPR/HML and the human liver ASGPR (50%) (25, 26), the rodent macrophage lectin (50%) (27, 28), followed by the chicken hepatic lectin (28%) (27) and rodent Kupffer cell receptor (20%) (29). 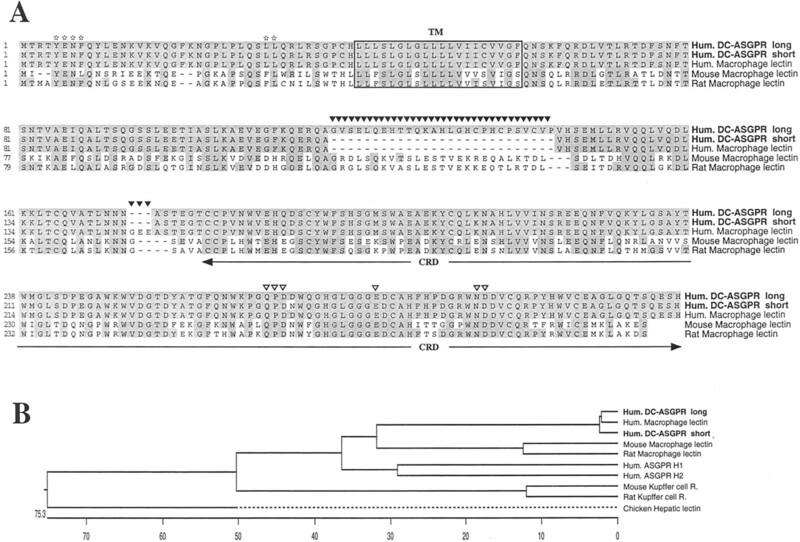 A phylogenetic analysis illustrating the conservation of amino acid sequences of the different ASGPR between species reveals that DC-ASGPR belongs to the family of macrophage lectins (human, mouse, and rat) (Fig. 1⇑B). Finally, in accordance with the predicted sequence, immunoprecipitation from DC extracts with mAb AS-3 anti-DC-ASGPR, followed by two-dimensional electrophoresis revealed a major 40-kDa protein with an approximate isoelectric point of 8.2 (Fig. 2⇓). Bidimensional electrophoresis of DC-ASGPR following immunopurification from DC with mAb AS-3. DC-ASGPR is visualized as a 40-kDa protein with an isoelectric point of 8–8.5. Northern blots probed with the ETA10 clone showed a band at 1.5 kbp. This band is slightly smeared and occasional other bands can be observed, in line with the existence of mRNA for different splice variants of DC-ASGPR. mRNA was detected in greatest quantity in PBL, spleen, lymph node, and fetal liver (Fig. 3⇓). DC-ASGPR can also be observed at lower levels in bone marrow, appendix, thymus, thyroid, stomach, colon, small intestine, ovary, testis, prostate, and liver. No expression was detected in pancreas, kidney, skeletal muscle, lung, placenta, brain, adrenal gland, trachea, and spinal cord (Fig. 3⇓ and data not shown). These results indicate a preferential expression of DC-ASGPR in immune tissues. DC-ASGPR mRNA is preferentially expressed in immune tissues. Poly(A)+ Northern blots of human tissues were analyzed with a [32P]dCTP-labeled probe specific to DC-ASGPR. A major band is seen at 1.5 kbp. The expression pattern of DC-ASGPR was first analyzed by Southern blot on various cDNA libraries using the ETA10 clone. As shown in Fig. 4⇓A, DC-ASGPR was strongly expressed in DC obtained in vitro from monocytes in cultures with GM-CSF and IL-4, and to a lesser extent in DC obtained from CD34+ progenitors with GM-CSF and TNF-α. No expression was detected in B cells, NK cells, or monocytes, irrespective of their activation state (Fig. 4⇓A). We next performed RT-PCR to determine expression of the long and the short forms of DC-ASGRP on primary cells and cell lines. Both forms of DC-ASGPR (long and short) were detected in DC, granulocytes, and PBL, but not in monocytes, T or B lymphocytes, or in any of the cell lines analyzed (Fig. 4⇓B). Cellular distribution of DC-ASGPR mRNA. A, Analysis of DC-ASGPR expression by hybridization with gel-fractionated cDNA inserts from libraries of different cell types. B and C, Analysis of DC-ASGPR expression by RT-PCR on various cell populations. Cells were activated and pools of cDNA from different samples were prepared as described (22 ). Amplification of β-actin was used as control for cDNA quantity and quality. These data indicate that DC-ASGPR is preferentially expressed by DC and granulocytes. DC generated in vitro from cord blood progenitors represent a heterogeneous population of cells that arise from different precursor subsets (CD1a−/CD14+ and CD1a+/CD14−) and display different functions (16). When such precursors were FACS sorted at day 6 and further recultured for 6 days in the presence of GM-CSF and TNF-α, DC-ASGPR mRNA was expressed on the CD14-derived DC (Fig. 4⇑C), which are in vitro counterparts of interstitial DC (16). In contrast, DC-ASGPR mRNA was not detected on the CD1a-derived DC, which resemble LC in phenotype and function (16) (Fig. 4⇑C). Accordingly, DC-ASGPR mRNA was not detected in LC, and anti-DC-ASGPR mAb failed to stain freshly isolated LC (data not shown). Also, as shown in Fig. 4⇑A, while no DC-ASGPR mRNA expression was observed in monocytes, a strong signal could be detected in DC derived from monocytes cultured with GM-CSF and IL-4 (18). 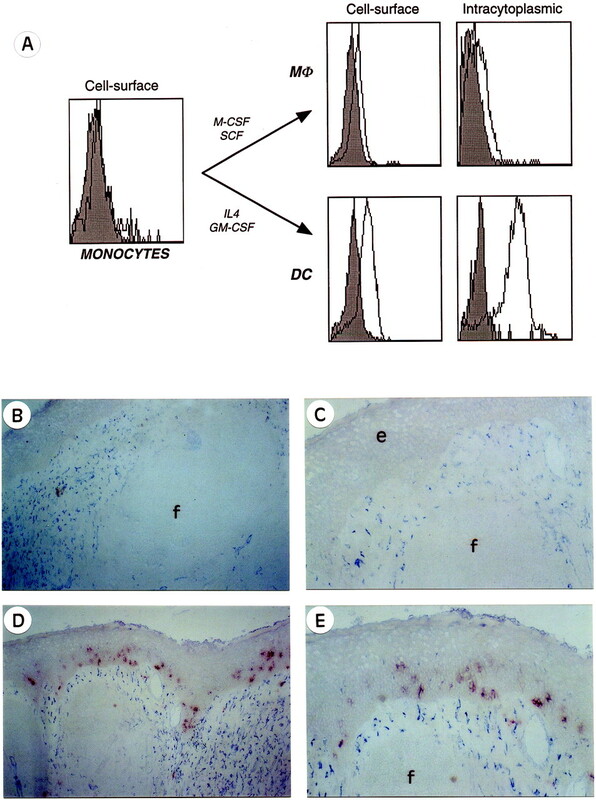 The same pattern was observed at the protein level, as DC-ASGPR was expressed both at the cell surface and intracellularly in DC obtained with GM-CSF and IL-4, but not detected in monocytes and detected only weakly in macrophages (Fig. 5⇓A). Consistently, DC-ASGPR+ cells in tonsil sections were mostly found beneath the epithelium and around the B cell follicles (Fig. 5⇓, B and C) and were absent from germinal centers. In serial sections, DC-ASGPR+ cells also expressed MR and CD11c (Fig. 5, D and E, and data not shown) but not CD1a (Fig. 5⇓, D and E). Finally, no transcription of DC-ASGPR was found in DC freshly isolated from blood (data not shown). Expression of DC-ASGPR protein. A, Staining with mAb AS-3 on monocytes isolated from peripheral blood, macrophages obtained from monocytes with M-CSF and SCF, and DC obtained from monocytes in GM-CSF and IL-4. B–E, Expression of DC-ASGPR in tonsil tissue section. B, Cells staining with mAb AS-3 (blue) are found throughout the tonsil, except in follicles. C, At higher magnification, DC-ASGPR+ cells (blue) are located beneath the epithelium, or in the suprabasal layer and present a dendritic morphology. D and E, In serial sections, the DC-ASGPR+ cells are MR+ (blue) and CD1a− (red). Indeed, Langerhans-like cells in the epithelium are stained with anti-CD1a mAb but not by anti-MR mAb, while MR-positive cells (DC-ASGPR+) are mostly present within the subepithelial region. Original magnifications are ×100 (B and D) and ×200 (C and E). e, Epithelium; f, follicle. During the culture of CD34+ progenitors with GM-CSF and TNF-α, DC-ASGPR mRNA (long and short forms) was detected at day 12 (Fig. 6⇓A). Activation with CD40 ligand, a strong DC maturation signal (30), down-regulated DC-ASGPR mRNA (Fig. 6⇓A). At the protein level, both cell-surface and intracellular DC-ASGPR staining were completely abrogated following CD40 ligation, while cell-surface MHC-II was up-regulated as a consequence of maturation (Fig. 6⇓B). As observed for the CD34-derived DC, expression of DC-ASGPR was down-regulated when monocyte-derived DC were cultured with CD40 ligand (data not shown). DC-ASGPR is down-regulated upon CD40 ligation. A, DC obtained from CD34+ progenitors were activated with fibroblastic L cells transfected with CD40 ligand or with mock control L cells, as described in Materials and Methods. DC-ASGPR mRNA expression was analyzed by RT-PCR as described in Fig. 4⇑. B, CD34-derived DC were processed as above. Cell-surface and intracytoplasmic DC-ASGPR expression was determined by FACS after staining with anti-DC-ASGPR or anti-HLA-DR mAbs followed by PE-conjugated anti-mouse Ig with or without permeabilization with saponin. Filled histograms represent staining obtained with a control mouse IgG1 mAb. Taken together, these data indicate that DC-ASGPR is preferentially expressed by DC affiliated to the monocyte lineage and is rapidly down-regulated upon maturation. As immature DC are specialized in Ag capture, we examined the role of DC-ASGPR in endocytosis. Thus, we analyzed the capacity of DC-ASGPR to internalize mAb anti-DC-ASGPR as a ligand. We found that Ab was rapidly internalized by DC at 37°C (Fig. 7⇓A). An ∼75% decrease of surface membrane-bound mAb anti-DC-ASGPR occurred within 10 min at 37°C, with kinetics as rapid as observed with an anti-MR mAb, as indicator of receptor-mediated endocytosis (Fig. 7⇓B). By comparison, an anti-CD1a mAb was internalized only with much slower kinetics (Fig. 7⇓C). The disappearance of cell-surface staining was due to receptor internalization, as it was not observed at 4°C, nor in paraformaldehyde-fixed DC incubated at 37°C as a control for Ab dissociation (Fig. 7⇓). mAb AS-3 anti-DC-ASGPR is rapidly internalized at 37°C. CD34-derived DC were labeled at 4°C with either mAb anti-DC-ASGPR (A), mAb DCGM1 against the MR (B), or mAb anti-CD1a (C), followed by biotin-labeled F(ab′)2 goat anti-mouse IgG. Cells were subsequently incubated at 37°C for the time periods indicated, cooled to 4°C, and stained with streptavidin-PE. Internalization was measured as decrease in cell surface-bound Ab determined by FACS analysis (•). No decrease of cell-surface fluorescence was detected in paraformaldehyde-fixed cells (♦). Results are expressed as the percentage decrease of MFI, as compared with control samples kept at 4°C (□). To analyze the intracellular distribution of DC-ASGPR, immunoelectron microscopy was performed. 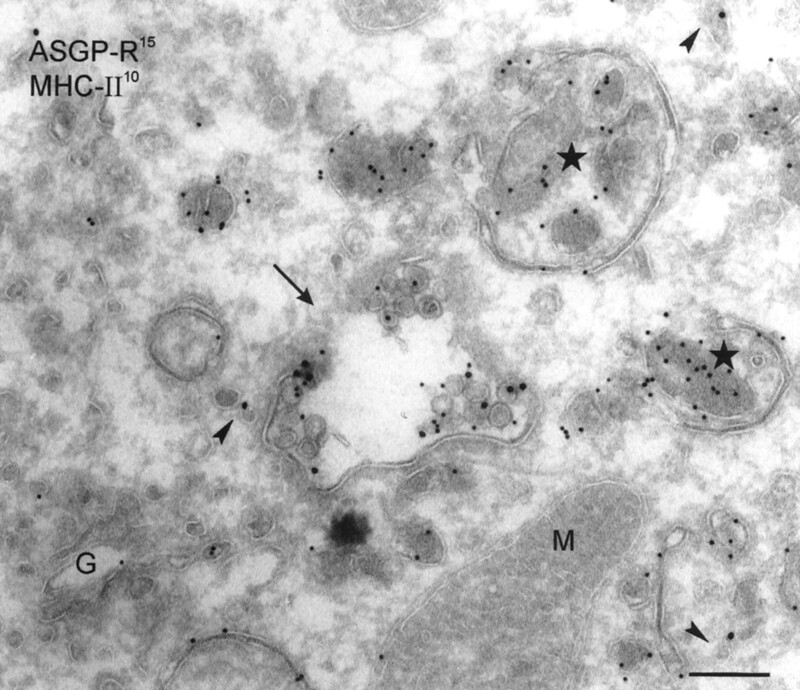 DC-ASGPR was found to be present in early endosomes and small vesicles that do not contain MHC class II molecules (Fig. 8⇓), a distribution reminiscent of the MR (31). In contrast, the majority of MHC class II molecules was localized in large vesicular, primarily multilaminar structures (Fig. 8⇓) reminiscent of MHC class II compartments (MIICs) described previously (32). Intracellular localization of DC-ASGPR. Immature DC were prepared from monocytes with GM-CSF and IL-4, and processed for immunoelectron microscopy as described in Materials and Methods. Double-immunolabeling with mAb AS-3 anti-DC-ASGPR (15-nm gold particles) and anti-HLA-DR (10-nm gold particles) shows that DC-ASGPR is located in an electron lucent compartment with few internal membranes (arrow), typical for early endosomes, and in small vesicles (arrowheads). HLA-DR is primarily located in multilaminar MIICs (stars) as expected. G, Golgi complex; M, mitochondria; bar, 200 nm. These results demonstrate that the DC-ASGPR is an endocytic receptor of immature DC that is likely to rapidly recycle following delivery of ligands into the endosomal pathway for Ag processing. In the present study, we report the molecular cloning and characterization of DC-ASGPR, a type II Ca2+-dependent transmembrane lectin with a single CRD (33). DC-ASGPR represents novel isoforms of the HML (10) and was found to be preferentially expressed by monocyte-derived/interstitial-type DC. As compared with HML, DC-ASGPR differ by a deletion of three amino acids for the short form and, for the long form, an additional 27-aa insertion in the neck domain preceding the CRD (10). A similar polymorphism exists in the hepatic ASGPR. The human hepatic ASGPR is exclusively expressed by hepatocytes and is constituted of two subunits of related amino acid sequence, H1 (46 kDa) and H2 (50 kDa), with several alternatively spliced variants of the H2 subunit (34). The HML was cloned from IL-2-activated human peripheral blood adherent cells, but the precise distribution of the receptor is unknown. In this work, we show that the strongest expression of DC-ASGPR mRNA is observed in immune tissues, with a preferential expression in DC and granulocytes. In contrast to the hepatic lectins, only a faint signal was observed in liver. Focusing our study on DC as APC, we have shown that DC-ASGPR is present in DC generated both in vitro from CD34+ progenitors and from blood monocytes. We observed a preferential expression on CD14-derived DC which are related to interstitial DC. Accordingly, DC-ASGPR was not detected in LC (data not shown). In addition, DC-ASGPR was not observed in monocytes and expression was decreased by signals inducing maturation like LPS, CD40 ligand, or TNF-α. Taken together, these results indicate that DC-ASGPR is expressed on immature DC with an interstitial phenotype. This conclusion was further assessed by immunohistological studies. Indeed, in tonsil, mAb anti-DC-ASGPR stained a subpopulation of MR+CD11c+CD1a− cells in subepithelial and perifollicular areas, whereas CD1a+ cells were observed in the suprabasal layer of the external epithelium. Hepatic ASGPR are responsible for degradation of desialylated proteins and were initially identified for their capacity to recognize galactosylated terminated proteins (11). As DC-ASGPR/HML contains intracytoplasmic tyrosine-based (YXX[/φ]) and dileucine internalization motifs (35), and displays considerable homology with the hepatic ASGPR, we hypothesized that DC-ASGPR functions as an endocytic receptor in DC. To test this possibility, we compared the time kinetics and levels of internalization of anti-DC-ASGPR mAb with those of an anti-MR mAb as indicator for receptor-mediated endocytosis. Following mAb binding, DC-ASGPR was as rapidly internalized as the MR, demonstrating its function as an endocytic receptor. Immature DC are specialized in endocytosis and for this purpose express a number of transmembrane lectins that appear to serve distinct functions. DC express type I multi-CRD lectins represented by the MR (3) or DEC205 (4), and type II single-CRD lectins exemplified by the CD23 low-affinity IgE receptor or the recently identified Langerin, specific for LC (5, 36). The MR and DEC205 deliver their ligands into Ag processing compartments that permit MHC class II-restricted presentation (4, 37), thus allowing DC to efficiently present low concentrations of glycosylated Ag to T cells (4, 18). The MR is not found in lysosomes but recycles constitutively in peripheral endosomes while releasing its cargo (37). Likewise, DC-ASGPR was not observed in MIIC but was observed in early endosomes, suggesting that DC-ASGPR functions like the MR in routing a different set of Ag (e.g., galactosylated) that may allow an increase in diversity of Ag specifically captured by DC. The natural ligands for DC-ASGPR have not been identified, but, of interest, HML displays a remarkable specificity for Tn Ag (10), which bears a cluster of serine or threonine-linked terminal galactose and N-acetylgalactosamine, and is associated with human carcinomas (38). In addition, DC-ASGPR exhibits considerable homology with mouse macrophage lectin (MMGL), the murine counterpart of HML. Homology is striking (60%) within the CRD, which confers specificity to MMGL for galactose and N-acetylgalactosamine (27). This includes the QPD motif, also found in the H1 and H2 subunits of the hepatic ASGPR (25, 39). MMGL, which has a YENL internalization signal in its cytosolic domain, functions as a receptor for endocytosis of galactosylated glycoproteins (9) and allows recognition of malignant cells by tumoricidal macrophages (40). In this context, MMGL is expressed within lung metastatic nodules of mice bearing OV2944-HM-1 ovarian tumors (41). Type II lectins have various ligands. Some have cellular ligands like DC-SIGN, which binds ICAM3 (42) and ICAM2 (43), or CD72, which recognizes CD5 (44). Other type II lectins that belong to the NK receptor family (e.g., NKG2; see Ref. 45) bind MHC class I molecules, and the LOX1 lectin binds oxidized low-density lipoprotein (46). Recently, SRCL, a scavenger receptor with a lectin CRD homologous to DC-ASGPR, was found to bind bacteria, suggesting a role in host defense (47). In addition, the Kupffer cell receptor, the hepatic ASGPR, and LOX1 are involved in binding apoptotic cell bodies (48, 49). Thus, identification of DC-ASGPR/HML ligands should give clues as to the range of function of this receptor in DC. It has been shown that exogenous Ag can be processed and presented in the MHC class I pathway following receptor-mediated uptake, phagocytosis of microorganisms or apoptotic bodies, or fluid phase uptake, by a phenomenon known as cross-presentation (50, 51, 52). Because some type II lectins are involved in uptake of apoptotic bodies, it can be speculated that DC-ASGPR performs such a function in DC by allowing loading onto MHC-I molecules. In conclusion, we have demonstrated that DC-ASGPR/HML is expressed by immature DC and efficiently mediates endocytosis. DC-ASGPR could potentially be a target for loading Ags into DC to enhance presentation to T cells in immune-based adjuvant therapy. The specificity of HML for Tn Ag (10) makes this carcinoma-associated Ag a candidate for selective delivery to DC-ASGPR in DC. We thank J. Griffith for excellent technical assistance, Dr. N. Fournier and Dr. E. E. M. Bates for helpful discussions, Dr. C. Caux and Dr. S. Lebecque for critical review of the manuscript, Dr. G. Trinchieri for support, and C. Alexandre and M. Vatan for editorial assistance. We are grateful to the personnel of clinics and hospitals in Lyon who provided us with umbilical cord blood samples and tonsils. We particularly acknowledge the assistance of the late Dr. J. M. Chiller, without whose guidance this study would not have been possible. ↵1 J.V. was supported by Fondation Marcel Mérieux, Lyon, France. M.J.K. was supported by Grant 805-48-014 from the Nederlandse Organisatie voor Wetenschappelijk Onderzoek. ↵3 Abbreviations used in this paper: DC, dendritic cell; CRD, carbohydrate recognition domain; ASGPR, asialoglycoprotein receptor; HML, human macrophage lectin; MMGL, mouse macrophage lectin; MR, mannose receptor; SCF, stem cell factor; LC, Langerhans cell; BLAST, basic local alignment search tool; MFI, median fluorescence intensity; MIIC, MHC class II compartment; rh, recombinant human.